To Chile for a week as the guest of Wines of Chile to check out some of the latest vinous treasures in a dozen or so wineries in this very long, very narrow, very hospitable country. 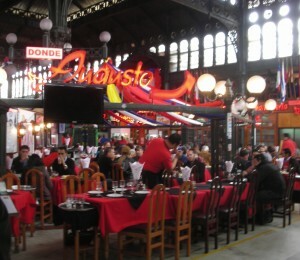 We arrive on a Sunday and are whisked off to a splendid lunch in the Central Market, a spacious 19thcentury hall with a wrought-iron roof like a mini Les Halles. 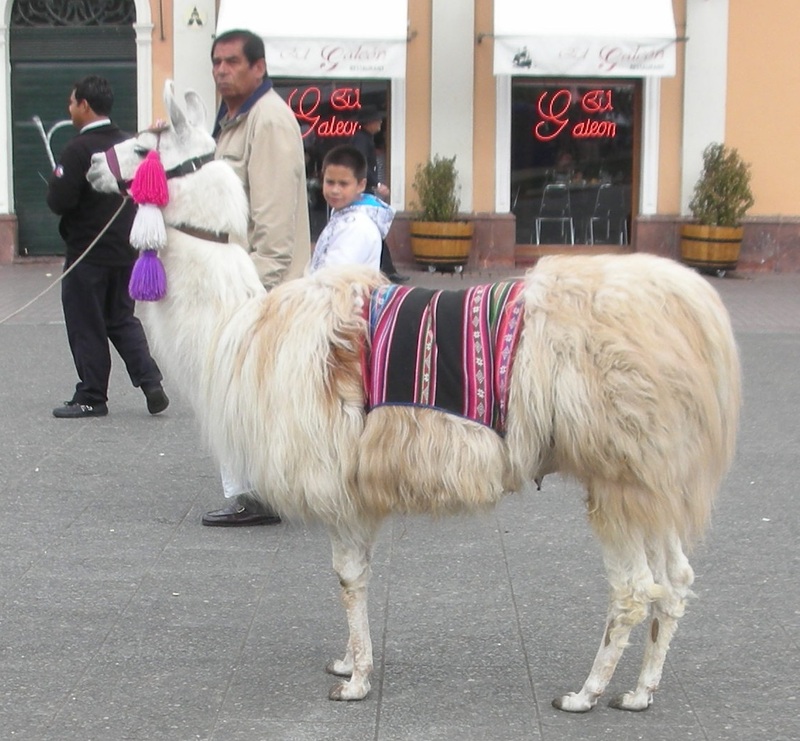 Out on the sidewalk is an alpaca, its saddle decorated with knots of coloured wool, and bands of uniformed waiters urging us to try their establishments. There used to be scores of small restaurants inside the market but most have them been bought by the most successful, Donde Augusto, and it is there our group of six sits down to eat surrounded by crowds of Chilean families, strolling singers with old guitars and a general mood of day-out merriment. Donde Augusto restaurant - more than merry! Alysson Silva, our hostess and guide from Wines of Chile, suggests we all share a bunch of dishes, the specialities of this fish and seafood restaurant – and the plan is a good one. First bread appears – flat heavy buns called hallulla which have been pierced with holes like the Easter loaves in Greece, and have the cakey texture of a scone. Bowls of a loose salsa called pebre are set down alongside – a sort of garlick-free chimmichura of onion, tomato and herbs. Does everyone want to start with a Pisco Sour? Of course! And it’s a beauty – pisco, lemon juice and sugar, no egg white – bright and refreshing. It only needed a few drops of Angostura bitters on its creamy, foamy head to be perfect. And then lunch… Cold chunks of abalone the size of a child’s fist, unexpectedly tender and with the subtlest of rock-pool flavours, dressed with mayonnaise and surrounded by lettuce and tomato. A little casserole of scallops, rims and orange roes attached, briefly cooked in oil flavoured with big crimson curls of dried chili, coarsely chopped garlic and green herbs. A second casserole of juicy shrimp as thick as my thumb cooked in just the same way. Almost stealing the show are razor clams on the half-shell smothered in melted cheese and then put under the grill until the cheese bubbles. Deep fried squid rings are deep fried squid rings – and always will be. 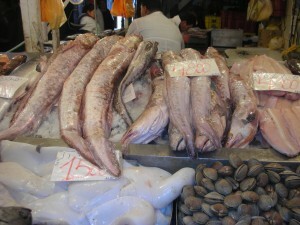 The main course is a platter of pan-fried fillets of fish – salmon, of course (it’s one of Chile’s five main exports – copper, molybdenum, salmon, wine and fruit is the order of importance) and conger eel (big flaky petals of the creature with no bones and the texture of monkfish), sea bass (corvina not the Patagonian toothfish we call Chilean sea bass) and reynata – a new fish to me that has the oily texture of mackerel but a snow-white flesh. Elsewhere in the market are the fishmongers with counters piled high with curious clams and shellfish and strange, hideous, glistening South Pacific deep-sea fish, half of which I don’t recognize. They are all Impeccably fresh, as they should be in a country with 4,000 kilometres of coastline. 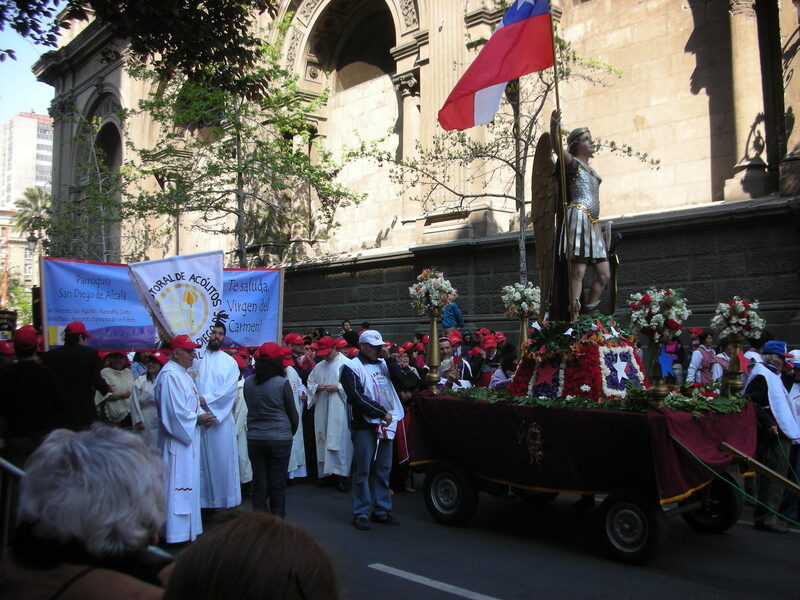 After lunch, we go for a walk, down to the cathedral where a parade is marshalling in honour of St. John the Baptist – groups of people in satin hoods and boys’ brass bands in pseudo-military jackets with outsized epaulettes and clusters of the devout around statues of local saints and heroes. A good beginning.